The Box Office opens from 9:30am daily with the first session commencing at 9:30am Monday to Sunday. Museum and Exhibition entry normally closes at 5pm, but closing times may vary so please check Ticketek for open hours information and any updates to sessions.The Museum and exhibition will be closed on Good Friday 19th April and will only be open a half day from 1pm on ANZAC Day, the 25th April. 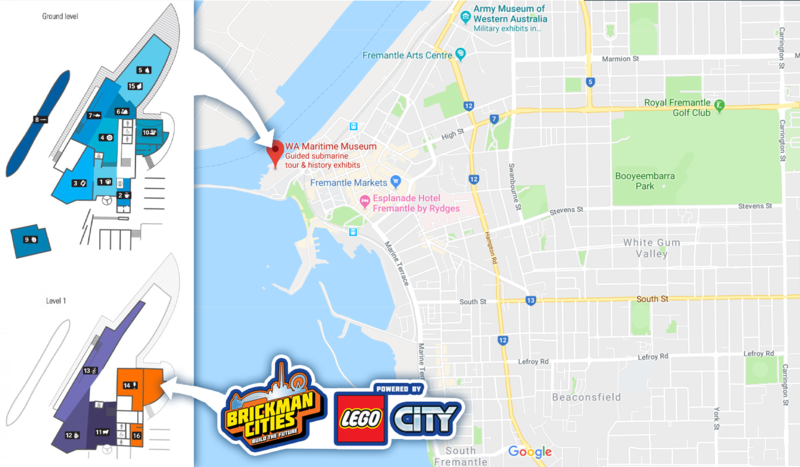 Your Brickman Cities ticket includes entry to the WA Maritime Museum and their current Kylie exhibition as well. Sessions last 60 minutes and we recommend 45-60 minutes to explore the experience. There is a general ATM located at the B Shed Ferry Terminal at nearby Victoria Quay, or a short drive away around Queen St near King’s Square. Approximately 30 metres with accessible path to Museum. Ramp to entrance, and universal access door push button operated.There are both ramps and lifts suitable for disabled access.